Guadalcanal Diary (1943 movie). William Bendix played the part of Corporal Taxi Potts in this great World War II film about U.S. Marines trying to gain the base at Guadalcanal from the Japanese. McGuerins from Brooklyn (1942 movie) Bendix played Tim McGuerin. Producer Irving Brecher got the idea of using William Bendix for the part of Chester A. Riley when he saw him in The McGuerins of Brooklyn. He looked rugged and blue collar. Bendix got the part after he auditioned. Radio's Life of Riley became a hit show. Wake Island (1942 movie) Bendix played Pvt. Aloysius K. "Smacksie" Randall. He received an Academy Award nomination for best supporting actor. Westinghouse Desilu Playhouse (TV). He played Peter Jenson in episode "The Time Element" November 10, 1958. Written by Rod Serling. A man dreams he is back in Pearl Harbor just one day before the Japanese attack. 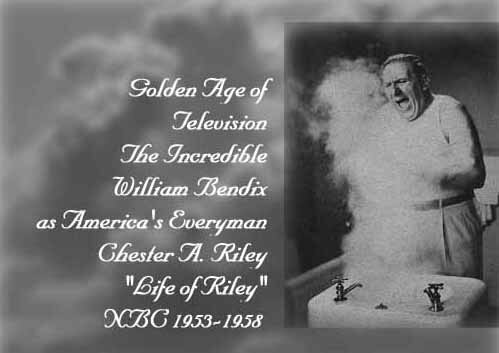 William Bendix was the honoree on the This Is Your Life TV program that aired November 9, 1955.